Jesus left the Jordan, the place where he was baptised and where the Spirit came upon him. The Spirit then led him into the desert, where for forty days he ate nothing. He was very, very hungry. 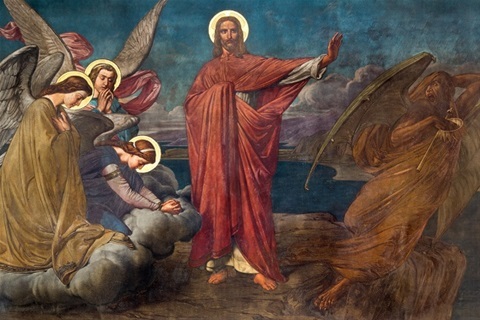 Then God allowed the devil, a bad angel, to tempt Jesus to see just how much he loved God. He said to him, “If you are the Son of God, why don't you turn the stones into bread?” But Jesus knew that he needed more than just bread to live on, so he told the devil to go away. But the devil had two more temptations! The devil led him up to a high place and showed him all the kingdoms of the world. And he said to him, “I will give you all of this if you just bow down to me!” But Jesus said, I told you to go away. You must worship God alone, so please leave me alone! Jesus proved just how much he loved God, so the devil left defeated. Jesus was left in peace to get on with God's work and the good angels came to look after him. Why did the devil tempt Jesus? To see if he loved these things more than he loved God. To lead him away from God so he wouldn’t do Gods work.